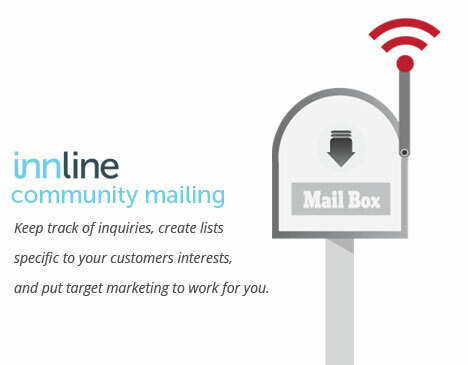 The InnLine Community Mailing program was developed to track potential visitors and provide them with information about the area. As these potential visitors browse your website, they have the option to fill in a request for information page. The InnLine software was developed to keep track of all inquiries that are processed through this page or over the phone. These inquiries can then be distributed to other local chambers as well as area businesses to draw those visitors into your area. Communities and properties who make use of the lists that are created can either use regular postal mailings or email. Targeted marketing is possible, with the ability to query on specific interests and/or dates of potential dates staying.